Why choose TotalKare for Vehicle Lifts? What service package is right for you? 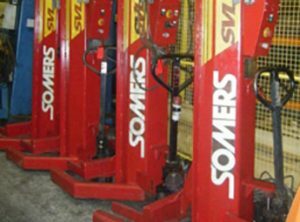 The RG Range of Heavy Duty Mobile Vehicle Column Lifts have a robust design ensuring a reliable lifting solution. The Series IV mobile vehicle column lift is lightweight and easy to use with a parachute nut technology. The SVL range of heavy duty vehicle lifts incorporates models SVL 2000 and the slim line SVL 2002. The MVL Range of heavy duty mobile vehicle lifts offers a quick, safe and reliable lifting solution and is ideal for low floor vehicles. The S6 RAV heavy duty mobile vehicle lifts first manufactured in 2006, the S6 RAV offers plc computer technology and has a lifting capacity of 7.5 tonne per column. 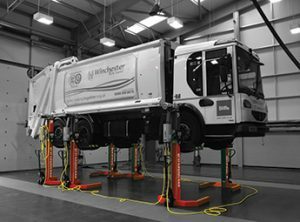 Our wireless mobile column lifts offer the perfect solution for workshops where manouverability and flexibilty is required from your column lifts. 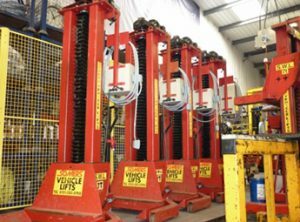 Our cabled lifts are designed for workshops where a more permanent location is required from your mobile column lifts, but still allow manouverability if required. Investing in new vehicle lifts can be a large capital investment for companies. 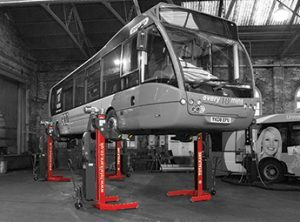 As well as supplying a range of new commercial mobile column lifts, four post lifts, two post lifts, ancillary products and service packages, TotalKare also offers a range of used vehicle lifts. The main reason for purchasing pre-owned lifts is that older models can be used in wash bays as they don’t contain modern electronics which can be damaged by water. These include TotalKare’s RG, MVL and SVL ranges. 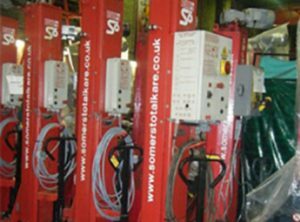 All TotalKare pre-owned mobile column lifts are steam cleaned, stripped and then repaired to the highest standards customers have come to expect from the UK’s number one supplier of mobile column lifts. If necessary, components such as load nuts, motor gearboxes, switches and cables will be replaced. The lifts are then load tested and inspected before an independent engineer carries out a Report of Thorough Examination to ensure the lifts meet LOLER requirements before leaving the TotalKare factory. I agree to allow TotalKare to store and process my personal data, and to allow TotalKare to send me marketing communications (you may unsubscribe at any time).